In the run-up to India’s 69th Independence Day, brands and corporates took over Twitter with patriotic fervor. I picked up a few campaigns that caught my eye. The most popular campaign was Reliance ADA Group’s homage to the Indian Armed Forces which got people to share their #SaluteSelfie on Twitter. In addition to the promoted tweets and trends the campaign got amplified and went viral with celebrities coming on-board and sharing their tricolor #SaluteSelfies. A simple concept tailor-made for social media. At last count the campaign had more than 20,000 picture shares. Yes Bank rose to the occasion and created buzz through multiple promotions. Through #RaiseTheTricolor and #IndiaboleYes initiatives on Twitter, they got followers to retweet and share what India should say ‘Yes’ to. The bank has also created a ‘Unity Anthem’ as an extension to the social development work they do through the Yes Foundation. Though simplistic in approach, the campaign does work. Yes, Essar has a Twitter campaign and an interesting one as well. The corporate created a special one-pager to showcase their #EssarPride moments. 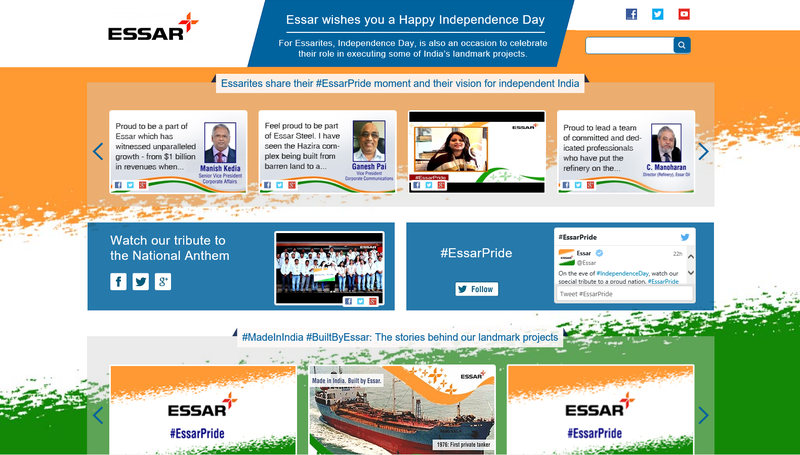 The platform shares stories behind their successful ‘Made in India’ ‘Built by Essar’ development projects and Independence Day thoughts from their employees. Topical and well executed. Also a special mention for Ola Cabs celebrating and giving away free rides to ‘independent women’ on Independence Day.